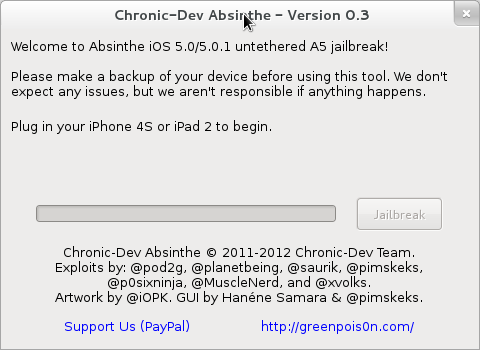 根据介绍，Absinthe 支持如下 iOS 设备和固件：使用 iOS 5.0 及 5.0.1 的 iPhone 4S(9A405, 9A406) 以及运行 iOS 5.0.1 的 iPad 2 Wi-Fi/GSM/CDMA. © 2002-2014 Linuxfans.org 86 queries. 1.257 seconds.